EpicDuel will be updating shortly to add part of an epic springtime release featuring new weapons, balance changes, and a new arcade game! Currently, many ideas for improving balance are being thrown around on the test server but there's not total confident in their viability. It's especially risky to push large balance changes over a holiday weekend when immediate corrective action wouldn't be possible. We're continuing to test and brainstorm ideas to revamp the skill trees to empower struggling classes and encourage build diversity. 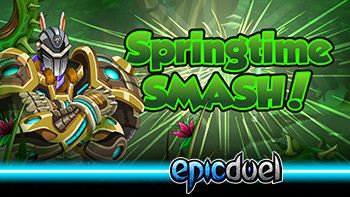 Try your luck and spend some tokens at the Springtime Smash Arcade featuring some new weapons from Bido! Visit Deuce for new seasonal gear! There's still more to come so don't feel too disappointed if some items from the previews, like the awesome Highlander armor, aren't present in the shop just yet! This the first part of our springtime release, the second part of which should have even more balance changes and seasonal content. In the meantime, have a safe and happy holiday weekend! Added an additional tier of diminishing returns for stats that kicks in after 100 points. This currently impacts Resistance and Defense to help counter tanky builds. Improved Support scaling for Auxiliary damage. 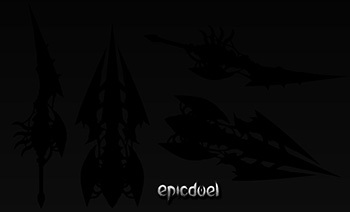 Epic Origins achievement that will be available with the EpicDuel poster from HeroMart. Reported but not a bug: Blood Lust and Reroute don't stack with other HP and EP regen cores. The engine is designed to use the highest value to determine regen so a skill that does 40% HP gain from damage will override max Blood Lust at 25%, rather than combining to become 65% HP gain. The day has finally come! It's been nearly 6 years and after hundreds of constructive and not-so-constructive comments, emails, and forum posts later Passive Skills have returned to the skill trees of EpicDuel! Party like it's 2013 and experiment with build options not possible in years, if at all! Passive skills return to replace their former active skills! If you're new to EpicDuel, you're probably wondering why this is significant. Passive Skills haven't been a part of the game since 2013 and the game has changed a lot since then. At the time, we felt that Passive Skills didn't make the battles feel dynamic enough. On the surface, Passive Skills aren't as cool as summoning a lightning bolt or activating a space laser, but because they can impact almost every round for 0 cost, they're extremely powerful and essential for most builds. We replaced them with new active skills hoping that would make energy management more valuable and diversity builds. 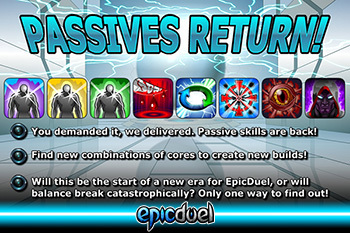 Sound theory, but the removal of Passive Skills left a large hole in EpicDuel that the new skills never quite replaced. This reversal could have happened much sooner, but many of the Passive Skills were completely shredded in the transition with the assumption that we would never go back. While some were simple to return (Blood Lust and Reroute are still equipped to many NPCs), others had to be rebuilt. This was a big, scary change with many unknown consequences, but hopefully it will all be worth it! Since this is such a major change to battle dynamics, and the game has changed so much in 6 years, we'll definitely need some follow up updates to balance the returning skills. This'll be an ongoing process, but a major step towards returning something dearly missed by longtime players. Since enough people liked the April Fool's armor, I've separated the head from the armor and added as a hairstyle. Now you can have whatever helm or hair you wish with the armor! Spirit Meld now properly ignores armor on user. Additional defense reduction penalty added to description. To refresh the classic Bunnyzookas, we've introduced the shiny new 2019 editions available at Brachylagus in the Biological Preserve Archives, complete with a new active core! 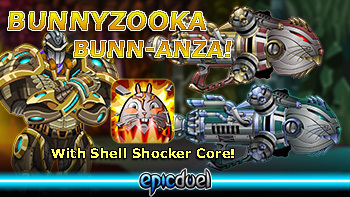 Comes equipped with Shell-Shocker active core: Reduce defense/resistance 10% and reduces healing 25% for 3 turns. 85% damage. 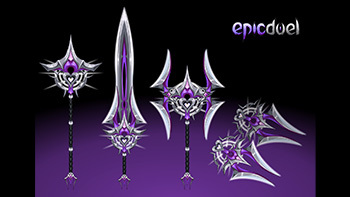 Available at Dage the Evil, these new active primary cores can make a huge different to the outcome of your duels! Screaming Soul Spears: Summon a blade barrage to cause 25 points of energy/health loss for 4 turns. 85% damage. Crimson Offering: Sacrifice 80 Health for 300 Energy. Spirit Well: Reduce and absorb enemy energy by 25% of normal strike damage. The Bunny Bot has a sneaky special attack that has been underused for ages. To improve this, we've expanded the triggers for the Egg Rain attack to include regular sidearm and auxiliary attacks. Core attacks and skills are still exempt. 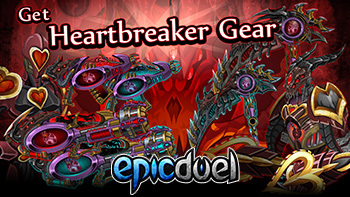 To encourage experimentation with some classic EpicDuel items, we've unlocked the cores on the Delta Gear. This was done as an experiment to see if it was something worth doing to other rare, locked gear. An incredible bounty of loot is finally available from HeroMart, including new designs to complement the return of old classics! 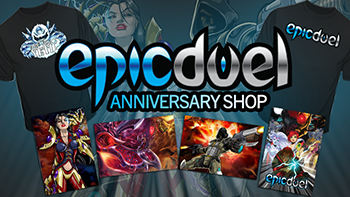 This marvelous merch comes with new home items, weapons, achievements in EpicDuel and AQW! What other kinds of EpicDuel merch would you like to see created for HeroMart? Spring is officially here and Easter is right around to corner, so Bido and Deuce are hard at work crafting some awesome new sets worthy of your extensive collections! Not among the new cores were a handful of new passives that were designed to give players a big advantage if their health dropped below critical levels. However, there were some problems in the battle engine that kept them from triggering properly at the health threshold, meaning they would be active the entire fight! I fought my own battle against the code for a bit but had to cut them for this update. Hopefully we can get them working as intended and in game in an upcoming update! One major project I've been planning to implement is the return of Passive skills to the skill trees. I'm very close to having the logistics ironed out for this project but I will need some programming advice to make sure nothing breaks. Changing Passive skills to Active skills was a major change that took a long time to implement so it shouldn't be surprising that reverting the change is taking longer than anticipated. Some of the Passives no longer exist so they must be recreated. Plus, modifying the skill trees is a complicated process that is very unforgiving. It's possible to break every character in the game with small mistake! No pressure, right? I don't remember. Anyway, I should return ready to tackle this major project to restore a bit of what you loved about the old battle engine. Hopefully, we don't prove the old saying true, "Be careful what you wish for..."
Now where did I put that Gamma.exe? Another issue I'd like to address is the speculation of plans for EpicDuel's future. In the near term, I've been able to secure additional help with creating art assets to make meatier releases. 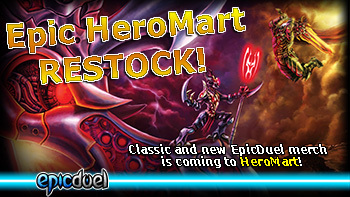 The increased attention EpicDuel has received also motivated HeroMart to restock old merch and create new merch. I've noted people expressing fatigue with the weapon releases, but developing new or restoring old features is mostly beyond my capabilities alone. Many of the new features you've enjoyed have been due to snagging snippets of Titan's time for consultation or development. Larger features that require days or weeks are trickier as he has regular obligations to AQ3D. It's frustrating, but Titan's new role comes with less autonomy than he enjoyed as the EpicDuel lead. That's part of the tradeoff when you sign up to work for a company rather than running your own business. What about EpicDuel 2? ED2D? EDBR? I see people demanding these new projects enter the pipeline constantly, and I agree with you! You don't have to convince *me* that EpicDuel is awesome and deserves an awesome future. I don't need convincing, but I don't have the autonomy to greenlight a project. As I understand it, the plan is to use AQ2D as a basis for converting the Flash games to Unity. Why does AQ2D get preference? AQW is much, MUCH bigger than EpicDuel. Even at EpicDuel's peak, it was orders of magnitude larger by nearly every metric. For those of you clenching your fists like the Arthur meme, note I said bigger, not better. Big is big. If that weren't the case, why on earth would EpicDuel only have one dev? That said, EpicDuel's players are some of the most enthusiastic and devoted fans of all the games, and that doesn't go unnoticed. I love our humble little PvP game, but I understand the rationale, especially when working with limited resources. I can't build the game on my lonesome as I've tragically dumped all my stats into art and charisma (obviously). What I can do is continue building on EpicDuel, creating new releases, updating balance, and adding features whenever I can. It's in my interest, and AE's interest to see EpicDuel thrive, contrary to claims of sabotage I've seen. I've lashed myself to the mast of this project for over a decade and I really don't know what I'd do beyond it -- a scary thought that's kept me up many nights, but maybe that's a nudge toward better personal development. I'm 100%, full-time EpicDuel and plan to continue for as long as you'll allow it. That's what I know at this current moment. That knowledge is always subject to change based on news I hear from on high, and I'll certainly update you all when that happens. I won't tease a project before it's 100% official. Thank you for your patience. If you're frustrated, know that it's mutual, but I aim to make the best of the present situation. 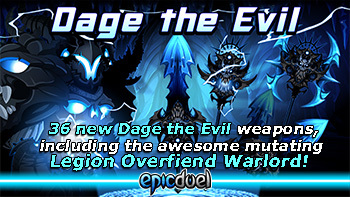 This week EpicDuel is overloaded with new Dage the Evil weapons available in class-specific varieties to let you craft a truly killer build! Also, production is still underway for EpicDuel's HeroMart bounty. The proof is in the proofs (printing humor) as the new posters arrive hot off the presses! 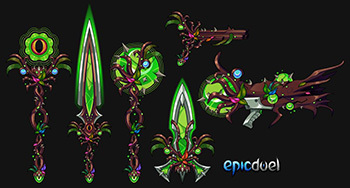 Dage wasn't done sharing his bounty with some glorious class-specific weapons for EpicDuel! Some of these are very low quantity, so the collectors will want to hurry to get them before they run out! As I write this Bido and Deuce are hard at work on more Spring/Celtic/Easter content that should be hitting the game soon! Be sure to follow them on Twitter for updates! Greetings! 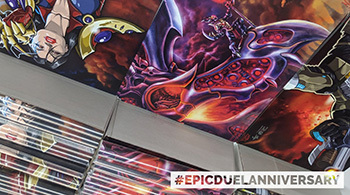 This week we have some very exciting news for those who have been hankering for a piece of EpicDuel merch, which have been out of stock for ages: HeroMart will soon be restocking sold out EpicDuel merchandise and selling brand new merch, which will include items in EpicDuel AND AQW! This should be great news for those of you who wanted another chance to get a piece of EpicDuel you can hold in your hand, hang on your wall, or cover your body! Be sure to follow HeroMart for the latest updates when these new products hit the shelves! We don't know how many they're producing, but we wouldn't sleep on it very long! Alydroid Hairstyle to complement the new war prize. These achievements will be available with codes from the upcoming new Heromart items! These weapons will be available with codes from the upcoming new Heromart items! These items will be available with codes from the upcoming new Heromart items! We'd like to formally welcome Junny Osan to the EpicDuel Team. He'll be working with us, joining Bido and Deuce for some much-needed art assistance! 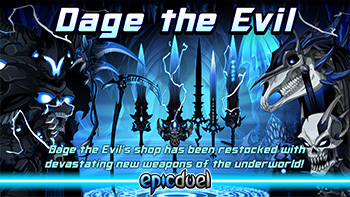 Meet Dage the Evil at the base of the Wasteland Minetower to inspect his amazing inventory of new weapons. This is already an impressive arsenal, but there are many more weapons on the way (next week)! Dage can gift you with the ability to warp your form into a new twisted abomination. Want to run throw Central Station as an undead horse? Now you can! Dage's Paragon armor has a new coat of bling. Those with heaps of Credits to spend couldn't ask for a more imposing way to show off their post-gifting wealth! Take on the ultimate challenge with a trusted ally. Regular Dage the Evil was already on of the most challenging bosses in the game. Will you be the first to defeat his Legendary form? Boost your rating score with 3 new achievements! That Legendary Dage Achievement is going to be tough to get! Buy an underworld dwelling of your very own! What would an underworld home be without plenty of Dage/Undead-themed decorations? If there's one thing all Dage fans can agree on, it's that you can never have too many skulls, bones, or blue fire! To help improve the viability of Focus builds, we've buffed Cyber Hunter's EMP and Plasma grenade. To compensate for the buff, Stun grenade base damage was adjusted to match Plasma Grenade. Ten years? Where does the time go? When we first launched EpicDuel's public Alpha ten years ago, we never would have imagined that kind of longevity for the game. During those lean times, subsisting on bulk ramen and generic cereal, we would have been thrilled at the prospect of half that lifespan. Thanks to players like you, we've succeeded beyond our wildest expectations, hosting millions of PvP battles for players from all over the world. Although the player count isn't near our peak, we're still live and updating after ten years, which is not a boast many other MMOs can make. Whether you're an Alpha, Elite, Founder, Beta, Gamma, Delta, Omega, or brand new player, thank's for visiting Delta V! A voice cries out from the Void. It screams "BUFF ME!" 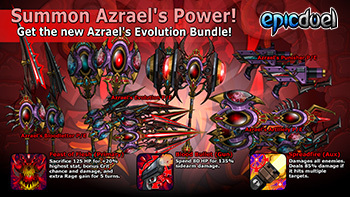 We answer, "Oh...Ok." This update sees a substantial buff to the skills of Azrael's Evolution promo pack in addition to a huge blast from the past you probably thought you'd never see again in EpicDuel! In response to player feedback, we've buffed the damage from the promotional cores to make them worth the sacrifice of precious HP for the boost to damage output. We've also made some adjustments to class skills, including an change that could make Intimidate a much saucier skill for Mercenaries and Blood Mages! Step into the Afterlife with a partner and challenge the Legendary Void King for the battle of your life (or unlife)! In desperate need of energy? Temporarily sacrifice some armor for a full tank with this potent new active armor core available from Endless M4tr1x. As a blast from the past, the Health and Energy Packs and Boosters have returned to Vendbots and Valestra! The Health Packs and Boosters are affected by Heal modifiers like Critical Heal and the Medical Mastery Legendary Skill. Need a boost to your Rating Points and have a few credits to spare...or a few million? Give yourself a belated Valentine by with the new upgradeable Tiny Heart Achievement! We just rolled a small patch with some skill adjustments and a major bug fix for the Azrael's Artillery auxiliaries. Spreadfire (Aux) should now work as intended in 2v2 and Juggernaut battles. It's a legendary artist fight, but this one won't be fought with pencils or pens.Throw down with LegendaryBido and Legendary Deuce, then take a spin on the new Heartbreaker Hoard Arcade machine! Earlier today, the Dread War went live, but something was wrong with the damage output. It turns out, the defenders had a damage bonus that was tilting the war in favor of the defenders. This has been corrected and a few effective war rallies could bring the deficit between the Legion and Exiles. Have an inventory packed full of Arcade Tokens? Check out the new Heartbreaker Hoard Arcade machine with some unique variations on classic Heartbreaker and Azrael gear in addition to some decorations to help you get in the holiday spirit! Will you be the first to max out the achievement? 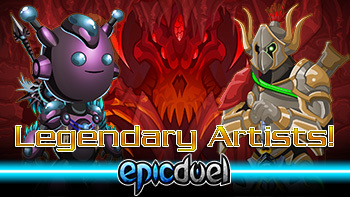 Welcome Bido and Deuce back to Delta V by challenging their new legendary forms to battle! Nothing says, "Welcome back!" like a bazooka to the face! 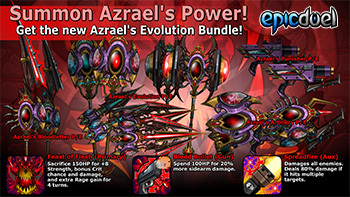 Check out this preview of upcoming Azrael / Heartbreaker Seasonal Rare as well as Deuce's awesome new armor and Tyrant Tank! Gifting is officially over and what a end it was! On behalf of EpicDuel and all of Artix Entertainment we'd like to congratulate the winners and thank them for their generosity. If you're a winner and haven't been contacted by Nightwraith, please check your spam filter or contact player support. Once again, congratulations! Your rewards are certainly well-deserved, and we've been impressed by the thought and creativity put into the wishes so far. As of this update, several of the winners will have received their prizes. Some are still in progress, but I hope to have all aside from Bandit J's rewards completed soon. We can't wait for you all to receive and show off your prizes! Classic battle backgrounds are now in the battle rotation! You may have noticed that the War has returned under the radar in Central Station. The gifting banner will remain until next week when Titan will be available to swap the banners back. 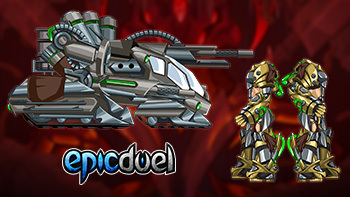 EpicDuel is pleased to welcome Bido and Tomcat/Deuce back onto the art team! Prepare to be taunted by their Twitter accounts as they tease previews of their latest creations! The extra help is definitely appreciated! 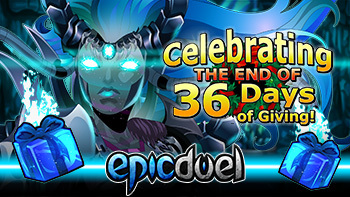 All good things must end, and that means EpicDuel latest Gifting event is finally coming to an epic conclusion! We'd like to extend a special thanks to all our gifters and giftees who helped this season shatter all previous records for generosity and excitement! Gifting will end officially at the server reset at the end of the day on Friday January 4th. The reset happens at midnight EST. That means Friday will be the final day for gifting. After that, the leaderboards will be locked in place, celebrating the grand champions of this epic gifting season! Gifting ended and I'm in the top 15! What now? First of all: CONGRATULATIONS! You absolutely destroyed the totals of all previous gifting events! You should be extremely proud of your contributions to the EpicDuel community, and we am humbled and honored by your generosity. After gifting officially ends, you will then be contacted by Nightwraith through one of your account's valid email addresses with further details. Please keep in mind that some prizes will be more complicated than others, especially the #1 custom prize, and may take some time to deliver fully. If you need some time to think, don't sweat! You can take your time thinking of a suitable wish. What do I do with my Secret/Silver Secret Package? You don't have to do anything! When the time is right for them to open, they will automatically transform into the appropriate item. 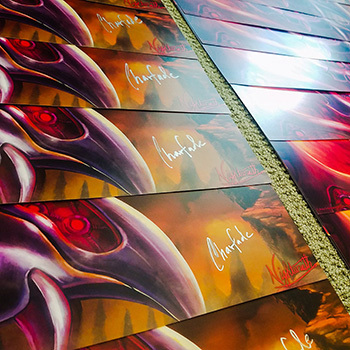 We want to leave a buffer between gifting and the prize reveal to make sure all the winners and package recipients are in good standing and to add a final polish pass on the prizes! We hope you like them, because they'll be some of the prettiest, most unique rewards in the game! Wrap up a spectacular Gifting season with a battle against Legendary Endless M4tr1x and win the Legendary Endless M4tr1x achievement! Before you challenge Legendary Endless M4tr1x to battle, check out her new items! Also check out the Epic Legendary Arsenal for a new armor for those with a mountain of credits to spare! 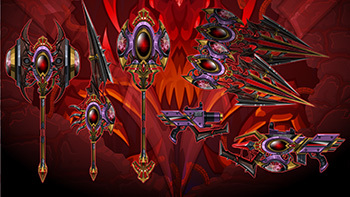 We'll be saying goodbye to the 2018 Omega Weapons, which will be leaving Nightwraith when when EpicDuel reboots for updates. Since the other games have extended their currency bonuses, we're extending our 15K Varium Epic Supporter package to January 11th! After the update on that day, the 15K package will be replaced with the 12K package and the Epic Supporter achievement will no longer be available with purchases of Varium packages. The Omega Wolf Package will be available awhile longer. 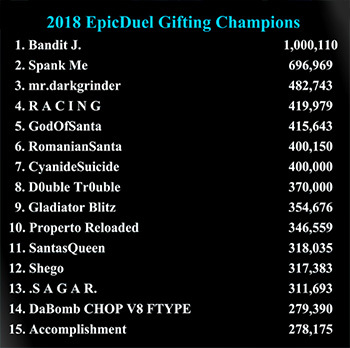 2018 ended with a huge victory for EpicDuel. The level of generosity and excitement from the community encouraging, surprising, and inspiring. We knew gifting would be a big deal, as it always is, but this year you knocked it out of the park and into the stratosphere. Where do we go from here, though? Lots of people want lots of different things in EpicDuel: New phases, new wars, new classes, new features, even a whole new game. More than a few want all of the above! Any one of those tasks would be extremely ambitious, but this year's resurgence was also ambitious. The passion in EpicDuel's community is undeniable and will usher in a new year of great possibilities for the game. This post is vague because while there are so many directions the game could go, including making real progress on EpicDuel's modest gameplan goals stating in a Design Notes post last summer, it's still difficult to see past the holiday haze and the work involved in the aftermath of gifting. That's why one immediate goal is acquiring an art assistant to help beef up EpicDuel's content and make it easier to focus on mid-long term development projects. However, that's only step one in the thousand step journey to an even greater 2019 for EpicDuel. The challenges facing Flash and the indie gaming industry from 2018 haven't vanished, but we know we'll have plenty of supporters willing to continue on the journey with us into an epic new year! Stay tuned as more plans coalesce in the new year!